In most enterprises, Tableau Server needs to communicate with the internet. Tableau Server was designed to operate inside a protected internal network. Do not set up Tableau Server directly on the internet or in a DMZ. Instead, communications between your network and the internet should be mediated using proxy servers. Forward proxy servers mediate traffic from inside the network to targets on the internet. Reverse proxy servers mediate traffic from the internet to targets inside the network. This article is for IT professionals who are experienced with general networking and gateway proxy solutions. The article describes how and when Tableau requires internet access, and describes how to configure your network and Tableau to use forward and reverse proxy servers for access to and from the internet. There are many third-party proxy solutions available, so some of the content in the article is necessarily generic. Before you configure a proxy server, see Communicating with the Internet. To enable communication from Tableau Server to the internet, deploy Tableau Server behind a forward proxy server. When Tableau Server needs access to the internet, it doesn't send the request directly to the internet. Instead, it sends the request to the forward proxy, which in turn forwards the request. Forward proxies help administrators manage traffic out to the internet for tasks such as load balancing, blocking access to sites, etc. If you use a forward proxy, you must configure the computers that run Tableau Server inside the network to send traffic to the forward proxy. Your organization doesn't use a forward proxy solution. If your organization is not running a proxy solution and the computer where you are installing Tableau Server can communicate with the internet, you don’t need to follow the procedures here. A proxy solution is deployed, and automatic configuration files define connection settings. If your organization uses automatic configuration files (such as PAC or .ins files) to specify internet connection information, you can use this information in the Local Area Network (LAN) Settings dialog box in Windows. For more information, see Enable Automatic Detection and Configuration of Browser Settings on the Microsoft support site. A proxy solution is deployed, but automatic configuration files are not deployed. For this scenario, you must configure LAN settings on the Windows computer that is running Tableau Server so that connections to your proxy server are run under the security context of the Run As User account. You must also configure localhost and other internal Tableau Server instances as exceptions. The following procedure describes the steps for the last scenario—a proxy solution without automatic configuration files, where Tableau Server is running on Windows Server. Note: If you are using a distributed installation of Tableau Server, perform the following procedures on the initial server node and on each additional node. To perform this procedure, you must log onto the Tableau Server computer as the Run As User. By default, the "log on locally" policy is not applied to the Run As User account. Therefore, you must temporarily add the Run As User account to the Local Administrators group. If you haven't installed Tableau Server on the computer yet, see Run As User for more information about creating the Run As User account. If you already installed Tableau Server and set the Run As User setting, you can determine the Run As User account name by logging onto Tableau Server. The Tableau Server Run As User is listed on the General tab of the Tableau Server Configuration window. To access the configuration utility, in the Windows Start menu, search for Configure Tableau Server. Add the Run As User to the Local Administrators group using steps in Add a member to a local group on the Microsoft website. When you've finished configuring the forward proxy information, you'll remove the Run As User account from the Local Administrators group. Using the Run As User account, log onto the computer where Tableau Server is installed or will be installed. Under Proxy server, select Use a proxy server for your LAN, enter the proxy server address and port, and then select Bypass proxy server for local addresses. Leave this dialog box open and continue to the next step. You add exceptions to this proxy configuration to guarantee that all communications within a local Tableau Server cluster (if you have one now or will have one later) do not route to the proxy server. In the Proxy Settings dialog box, enter localhost in the Exceptions field. In addition, enter the server names and IP addresses of other Tableau Server computers in the same cluster. Use semicolons to separate items. 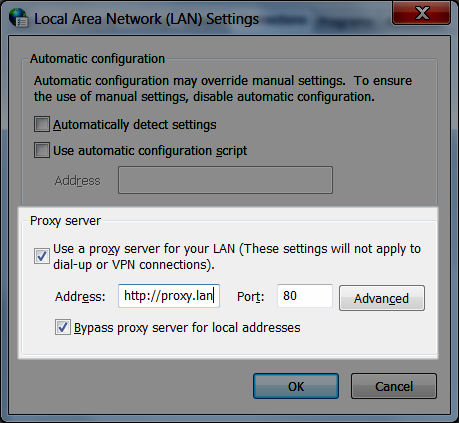 Close the proxy settings dialog box and the Local Area Network (LAN) Settings dialog box. In the Internet Properties dialog box, click OK to apply the settings. Stay logged onto the computer and continue to the next step. Some organizations configure forward proxy settings as environment variables in the Windows operating system. If such settings are configured on the computer that is running Tableau Server, then you must verify that they do not conflict with the configurations you've completed here. On the computer that is running Tableau Server, enter "advanced system settings" in the search box and then click Enter to open the System Properties box. In System Properties, click Environment Variables. Scroll through the System variables field. If http_proxy or https_proxy are specified, verify that the values do not conflict with the proxy server address that you configured in the previous step. If the existing settings do not conflict, then go to "Step 5: Test the proxy configuration." If the existing settings do conflict, then create a new variable named no_proxy, and enter the host name, IP address, and port of the Tableau Server for the value. For example, localhost,192.168.0.10:80. For more information see the Microsoft MSDN article, Set Environment Variables. If the configuration is working, you see a map of Miami and Havana. This indicates that the Tableau Server computer is able to access the internet through the proxy. After you have tested the proxy settings, remove the Run As User account from the Local Administrators group. Leaving the Run As User in the administrator group unnecessarily elevates the permissions of the Run As User group and is a security risk. Restart Tableau Server to ensure that all changes are implemented. A reverse proxy is a server that receives requests from external (internet) clients and forwards them to Tableau Server. Why use a reverse proxy? The basic answer is security. A reverse proxy makes Tableau Server available to the internet without having to expose the individual IP address of that particular Tableau Server to the internet. A reverse proxy also acts as an authentication and pass-through device, so that no data is stored where people outside the company can get to it. This requirement can be important for organizations that are subject to various privacy regulations such as PCI, HIPAA, or SOX. The following diagram illustrates the communication path when a client makes a request to Tableau Server that is configured to work with a reverse proxy server. The reverse proxy maps that request in turn to a request to Tableau Server. The reverse proxy can be configured to authenticate the client (using SSL/TLS) as a precondition to passing the request to Tableau Server. Tableau Server gets the request and sends its response to the reverse proxy. The reverse proxy sends the content back to the client. As far as the client is concerned, it just had an interaction with Tableau Server, and has no way to know that the communication was mediated by the reverse proxy. For better security, you should configure reverse proxy servers to use SSL for any traffic that's external to your network. This helps to ensure privacy, content integrity, and authentication. Unless you've deployed other security measures to protect traffic between your internet gateway and Tableau Server, we also recommend configuring SSL between the gateway proxy and Tableau Server. You can use internal or self-signed certificates to encrypt traffic between Tableau Servers and other internal computers. Tableau Server adds an X-header to all HTTP responses for Tableau Mobile sessions. By default, most proxy solutions will preserve X-headers. If your proxy solution does not preserve X-headers, then you will need to configure your proxy server to preserve the following header to all HTTP responses for Mobile client sessions: X-Tableau: Tableau Server. If you have configured authentication at the proxy server gateway, then your proxy server must respond to Tableau Mobile HTTP requests with a HTTP 302 response. The 302 must include a redirect to the identity provider login page. To view a diagram that describes the 302 authentication sequence, see Tableau Mobile Authentication Sequence in the Tableau Community. Tableau Server will always authenticate users. This means that even if you are authenticating inbound connections at the gateway for your organization, Tableau Server will still authenticate the user. For supported web browsers, you can use SAML, OpenID Connect, Kerberos, Trusted Tickets or manual authentication with a reverse proxy. However, we recommend a transparent scenario where user requests are not prompted for authentication at the gateway. This recommendation doesn't prohibit using SSL for client/server system-level authentication at the gateway proxy, in fact, we strongly recommend SSL system-level authentication. Tableau Mobile supports SAML or manual authentication with a reverse proxy. The iOS version of Tableau Mobile additionally supports Kerberos with a reverse proxy. The same recommendation above applies. Tableau Desktop does not support authentication with a reverse proxy. To support remote access with Tableau Desktop, use a VPN solution or configure your reverse proxy to route traffic from Tableau Desktop directly to Tableau Server for authentication. Active Directory with Enable automatic logon (SSPI) is not supported with a reverse proxy. Tableau Server must be configured for reverse proxy before configuring Tableau Server for Kerberos. For more information, see Configure Kerberos. Before you configure Tableau Server, you'll need to collect the following information about the proxy server configuration. To configure Tableau Server, you use the tsm configuration set command. The information you need to collect corresponds to options you'll need when you run tsm. Most of the following tsm options are also used to configure Tableau Server deployments that operate behind a load balancer. For more information, see Add a Load Balancer. You can either enter an IP address or a CNAME for this option. The public IP address or addresses of the proxy server. The IP address must be in IPv4 format, such as 203.0.113.0, and it must be a static IP. Ports Port numbers for traffic from the client to the reverse proxy server. If you are using a distributed installation of Tableau Server, then run the following tsm commands on the initial node in your cluster. If your organization uses multiple proxy servers, enter multiple IPv4 addresses , separating them with commas. IP ranges are not supported. To improve start up and initialization of Tableau Server, minimize the number of entries for gateway.trusted. Enter the following command to specify alternate names for the proxy server, such as its fully qualified domain name, any not fully qualified domain names, and any aliases. If there's more than one name, separate the names with a comma. Note: If the proxy server is using SSL to communicate with Tableau Server, SSL must be configured and enabled on Tableau Server. When a client accesses Tableau Server through a reverse proxy, specific message headers have to be preserved (or added). Specifically, all proxy servers in the message chain must be represented in the gateway.trusted and gateway.trusted_hosts settings. REMOTE_ADDR and X-FORWARDED-FOR (XFF) Tableau Server needs these headers to determine the IP address of origin for requests. X-FORWARDED-FOR header must present IP address chain to Tableau Server in the order the connections have occurred. The IP address that you set ingateway.trusted must match the IP presented in REMOTE_ADDR. if you sent multiple addresses ingateway.trusted, one of them must match the IP presented in REMOTE_ADDR. HOST and X-FORWARDED HOST (XFH) These headers are used to generate absolute links to Tableau Server when it replies to the client. X-FORWARDED-HOST header must present host names to Tableau Server in the order the connections have occurred. The host names that are presented in X-FORWARDED-HOST header must be included in the host names that you specify in gateway.trusted_hosts. X-FORWARDED-PROTO (XFP) This header is required if SSL is enabled for traffic from the client to the proxy, but not for traffic from the proxy to Tableau Server. The X-FORWARDED-PROTO headers are important for scenarios where HTTP or HTTPS is not maintained along each hop of the message route. For example, if the reverse proxy requires SSL for outside requests, but traffic between the reverse proxy and Tableau Server is not configured to use SSL, X-FORWARDED-PROTO headers are required. Some proxy solutions add the X-FORWARDED-PROTO headers automatically, while others do not. Finally, depending on your proxy solution, you might have to configure port forwarding to translate the request from port 443 to port 80. Port configuration on reverse proxy (inbound connections from client and outbound connections to Tableau Server) must be specified in the corresponding parameter: gateway.public.port, which is the port clients use to connect to the proxy. If the proxy server is using SSL to communicate with Tableau Server, SSL must be configured and enabled on Tableau Server. To validate your reverse proxy setup, publish workbooks and datasources using Tableau Server web authoring or Tableau Desktop. If you are connecting with a web browser to Tableau Server from the internet, verify that you are using a recommended browser. Publish and view workbooks that use existing datasources as well as a datasource that you've published . Use the links below to familiarize yourself with connecting with Tableau Server as an end-user. Tableau and Microsoft have partnered to ensure that you can use Azure AD Application Proxy to provide remote access to web browsers and to the iOS version of the Tableau Mobile app. Tableau Desktop does not recognize reverse proxy authentication requests, and is not supported for this scenario. When setting up Azure AD Application Proxy with Kerberos authentication, it's important to configure the proxy before you configure Kerberos.